If you have any questions regarding certain artists or a special artwork, do not hesitate to contact us! And you are, of course, always welcome to visit our Gallery in Münster, Germany. The Steinroetter Gallery celebrated its 40 Year Anniversary in 2007. We have printed an Edition and a Book, "40 Years Steinroetter Gallery", with many contributing artists (The Edition is only 100 Copies with each 17 artworks). New Works by Carsten Weitzmann are online! New works by Hermann Reimer are online! Hermann Reimer, new artist with our Gallery. Willy VERGINER in the JUXTAPOZ Magazine. New works by Francisco Correa Lira. New works by Dorothee Bachem online. New artist page - Willy Verginer. New artist page - TRAK Wendisch. New artist page - Artist and Sculptor Igor Ustinov. New painting by Jaroslav Kurbanov. 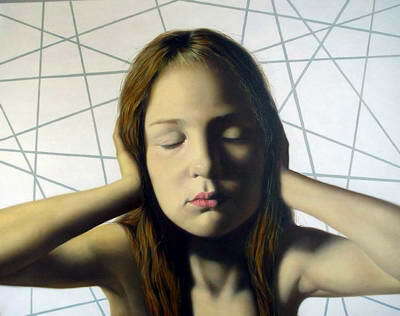 New works by Francisco Correa Lira are online. Two new paintings by Berlin artist Hans Joachim Billib. New Paintings by Iaroslav Kourbanov are online. Photos of the Exhibition "Paul Wunderlich: Pastels" are now online. New Paintings by Francisco Correa Lira are online. Celebrating Klaus Fussmanns 70th Birthday, the "Landesmuseum Schleswig Holstein" will open a retrospective show on Sunday, the 27.04.2008. Johannes Grützke can be seen in two big Retrospectives in October and November, celebrating the artists 70th Birthday. The Georg-Kolbe Museum in Berlin opens its Exhibition on the 4th, the Museum Schloss Gottorf in Schleswig can be seen all of October until the 18nth of November. I updated the artists page as well. New Paintings by Franciso Correa Lira. New Paintings von Jaroslav Kourbanov are online. Pictures of the Exhibition "40 Years Steinroetter Gallery" are now online. A new painting by Wainer Vaccari is online. An Update on the "40 Year Edition" Page. A new artwork of the week is online. On the 1st of May I will start curating the Anniversary Exhibition, showing works of all artists of our Gallery. New Informations regarding the 40 Years Anniversary Edition of the Gallery Steinrötter. Instead of a solo Show we will present new works of Jan Peter Tripp together with other artists of our Gallery, starting 1st of May 2007. We have set the dates for the two big summer shows. The Presentation of our Anniversary-Edition will be on the 2nd and 3rd of June. The Exhibition of new works by Anke Feuchtenberger will open on the 8th of July. The Jan Peter Tripp Show is still not certain. The "Landesmuseum Schloß Gottorf" in Schlewig opens a retrospective of Paul Wunderlichs Works commemorating his 80th Birthday: "Paul Wunderlich. Poetry and Precision. Works 1987-2007." Opening is on the 1st of April 2007. A new Contribution to the Edition "40 Years Steinroetter Gallery" is online - the one from Carsten Weitzmann. Oh, and a few more too. There will be a big Exhibition of Marta Volkovas and Slava Shevelenkos Work in Baden-Baden. "Last Day of Pompey" - in the "Gesellschaft der Freunde der jungen Kunst e.V.". The Exhibition will last from 01.04. - 13.05.2007. You can download the Poster for the Exhibition here. New Contributions to the Edition "40 Years Steinroetter Gallery" are online. You can see Günter Malchows Paintings until the 22nd of April in the Exhibition "Günter Malchow. Strukturale Konstruktion. Fläche. Form. Raum" in the "Fritz-Winter-Haus Ahlen". New Contributions to the Catalogue "40 Years Steinroetter Gallery" are online. We will present the "Hornsleth Village Project Uganda" during the "Skulptur 07" in the Steinroetter Gallery, most likely in July. You can read an article abouts Kristian von Hornsleths "Uganda Village Project" in the new "art" (2/2007).